It’s no secret that I am an unadulterated cheesecake fanatic. If it’s on a menu, I can’t turn it down. 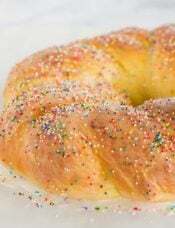 It’s my birthday cake of choice, and I’ll come up with the most obscure excuses to bake one up at home. I love trying new varieties when out, and experimenting with new recipes when at home. 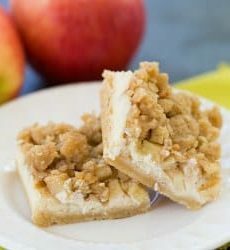 If there ever happens to be time when I don’t want to make a full-blown cheesecake, I’ve found cheesecake bars to be a more than acceptable substitute. In some cases, they’re (gasp) even better. You can pick them up and eat them without a plate and a fork, and you don’t feel nearly as guilty if you eat multiple pieces (I speak from experience, of course). 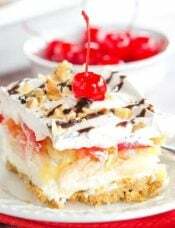 In the past, I’ve whipped up Chocolate Chip Cookie Dough Cheesecake Bars, Dulce de Leche Cheesecake Squares, and Eggnog Cheesecake Bars, all of which were amazing. 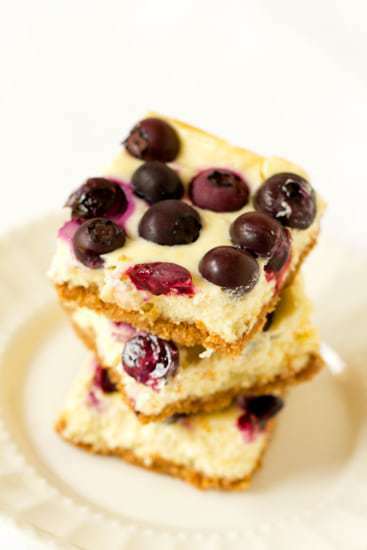 With summer on our doorstep, I was salivating just thinking about the bright, fresh flavors of cheesecake bars loaded with lemon and blueberries. 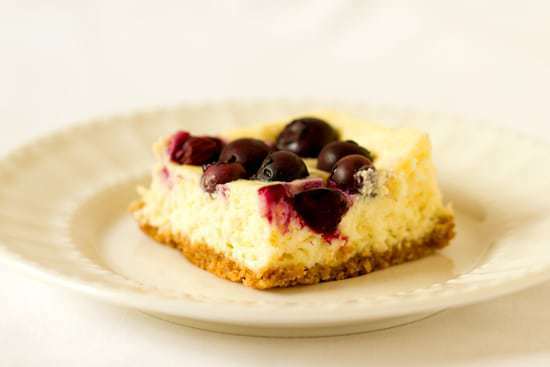 Cheesecake is my favorite dessert, and blueberries are absolutely my favorite fruit, which makes them a match made in heaven! Last Sunday, my mom and I had a marathon garden-planting day, which included a 2-hour trip to Lowe’s. We had a list of plants we definitely wanted to buy, and then, of course, we impulse-shopped like nobody’s business. Among those impulse purchases? A beautiful blueberry plant. Although berries grow wild around many parts of the area we live in, I’ve never attempted to actually grow fruit myself. All of those little budding blueberries were too much to resist, and I snatched it up faster than a cute pair of shoes. Hopefully in a couple of months I can walk out onto the deck and grab the blueberries for my oatmeal (or my latest baking project), instead of going to the fridge and opening a plastic container! 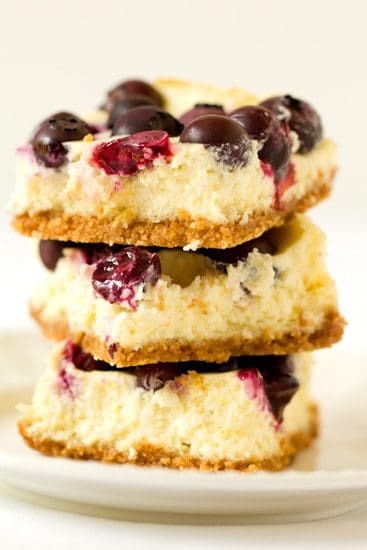 In the meantime, I’ll trek to the grocery store for blueberries if the end result is a plate full of cheesecake bars infused with lemon and loaded with blueberries! Hello summer! Have any of you grown blueberries (or strawberries or blackberries) before? Any tips? Preheat oven to 325 degrees F. Grease a 9x9-inch baking pan with butter. Line the pan with parchment paper, letting excess hang over the sides of the pan. Make the Crust: In a food processor, process the graham crackers, sugar, and cinnamon until you have the texture of bread crumbs. Add the melted butter and pulse a couple of times to fully incorporate. Press the mixture into the lined baking pan and gently pat down evenly. Bake for 12 minutes, until golden. Set aside to cool. Make the Filling: Wipe out the food processor. Add the cream cheese, sugar, eggs, lemon zest and lemon juice. Process until well combined. It should have a smooth consistency. Pour the filling onto the cooled crust and then sprinkle the blueberries over top. The blueberries will sink slightly, but should still be half exposed. As they bake, they will sink a little more and break down. Bake in the oven for 35 minutes or until the center only slightly jiggles. 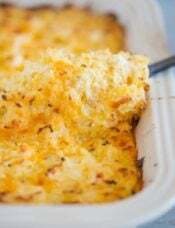 Remove from the oven and cool completely to room temperature and then refrigerate for at least 3 hours before serving. Once set, remove from pan using the parchment lining and slice into 16 square bars. 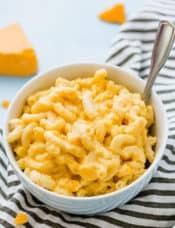 Can I line the pan with aluminum foil instead of parchment? Hate to buy another roll to jam into the drawer. I already have regular foil and nonstick foil. Thanks. Hi Linda, Yes, you can use aluminum foil, just be sure to grease the foil, as unlike parchment paper, it is not non-stick. I made these for a bbq we had this past weekend and they were delicious! I did not have a square pan so instead I used a 9 inch pie plate and made a cheesecake pie instead of bars, amazing either way! I made these tonight and they turned out great!! 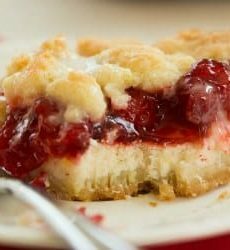 I did them in a muffin tin with liners – it made 18 little treats and I baked the crust about 5 minutes before I added the cream cheese mixture – and then baked them for about 25 minutes at 325 degrees. I am serving them at a get-together tomorrow and I thought they would look prettier in the muffin liners than trying to cut them pretty! Thanks for sharing a winner! Just made these–delicious! Blogged about them (http://chefincollege.blogspot.com/2013/06/lemon-blueberry-cheesecake-bars.html) and credited you for the recipe. They were a huge hit. Thanks! Would it be possible to use a spring form pan to make this? What are your thoughts on a water bath? Hi Kristen, These bars would be much too thick in a springform pan. 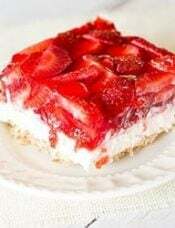 There is no need for a water bath; I would recommend sticking with the 9×13-inch pan unless you want to make an actual cheesecake; in that case, I wouldn’t recommend just pouring this batter into a springform pan. I would adapt an actual cheesecake recipe. I actually made this recipe last night. I needed good way to use up some frozen blueberries that a friend gave us. I followed the recipe it to the T except: I used about 1/4 cup less blueberries and I put the juice of only ONE lemon in. It came out great. I had to use an 8-in pan rather than nine, so mine’s a bit thicker. As you could have predicted, all that lemon rind drowned out the always weak flavor of the blueberries. But still I like it. 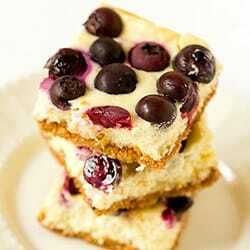 It is very difficult to get blueberries to stand out from surrounding flavors. I might try to leave the lemon out entirely next time as an experiment, but I love lemon so. This is a relatively healthy type recipe: It uses just the right amount of sugar, not sickening sweet, as I so often find. I made these last week, and they were completely delicious. 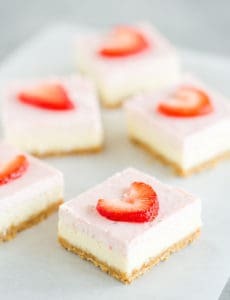 Everyone (even non-cheesecake lovers) adored them. The lemon is so.fresh. Perfect recipe that is now a part of my regular rotation! Thanks so much. Just delightful! I made these for a party last night and my friends raved! 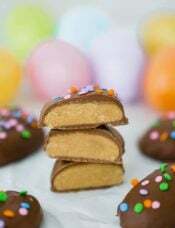 These are so decadent and I am keeping this recipe as a go to for spring and summer parties. I made these last night and had a few issues. I had to improvise with the crust as I had graham cracker crumbs on hand and not whole crackers, but the crust came out delish! My real issue was not having a food processor. I should have creamed the sugar, eggs and cream cheese prior to adding the juice (of which I had too much since my lemons were HUGE). But, I followed the recipe as written. The flavor of the bars is AMAZING! Sadly, the texture isn’t creamy as pictured, it’s almost chunky, which for me takes away from the goodness of the bar. I will try again when I have more blueberries.